Erin focuses her practice on restructuring and distressed commercial transactions and disputes. 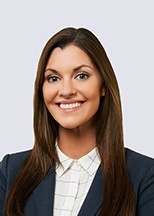 She has advised private equity sponsors, management teams, and boards of directors of financially distressed public and private companies as well as purchasers, new investors, and creditors of such companies in complex corporate reorganizations, distressed M&A and finance transactions, and state, bankruptcy, and appellate litigation. Her broad-based knowledge and experience allow her to effectively represent clients through constantly-changing, multifaceted, and interrelated aspects of a distress situation.